This is a set of cute bibs for little ones! 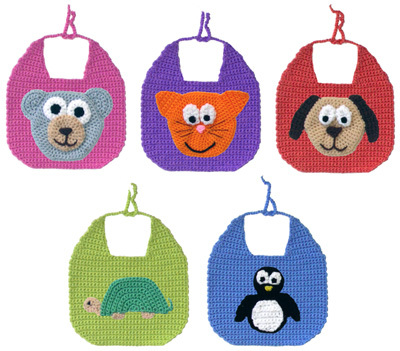 It includes 3 different bib sizes and 5 different animal appliques! 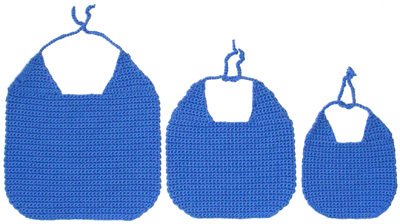 Mix and match as you desire to make the perfect bibs for any sized baby or toddler. This pattern set is now available in the Crochet Spot Store. Then pick an animal…or make them all! This pattern set is now available in the Crochet Spot Store! Please visit the store to purchase and instantly download the pattern. If you’re a monthly Premium Pattern Member, then just sign in and download, no payment required. This entry was posted on Thursday, July 9th, 2009 at 7:28 PM by Rachel Choi	and is filed under Best Crochet Patterns. You can follow any responses to this entry through the RSS 2.0 feed. You can leave a response, or trackback from your own site. YAY! I’m glad you like them! These ARE adorable!! Nice work there. They are VERY cute. I was going to use a pattern I saw in my Crochet World magazine (the bib is a monkey face), but these seem to flow better. Keep up the great work, Rachel! Cute! I’ve been on a bib making binge the last 2 weeks! IDK if you pattern calls for it, but if you SL down the ties, it’ll make them more sturdy.